We now know that Saturn’s rings share a process with spiral galaxies, and the unique co-orbital pattern of two of its moons get some attention. 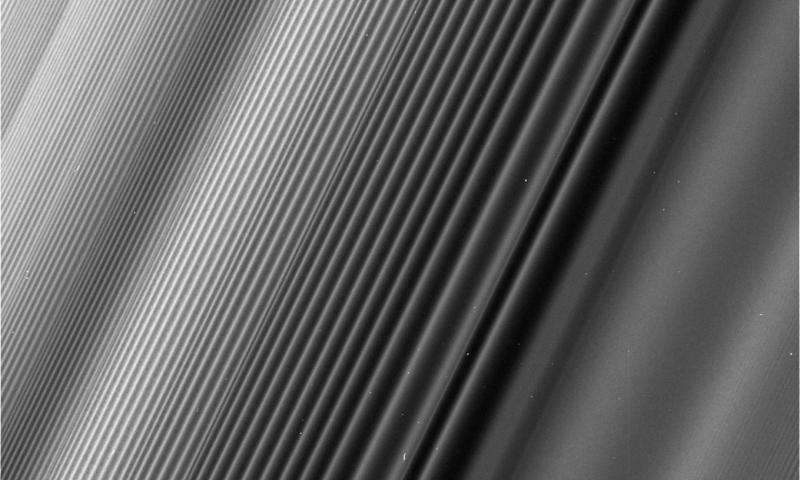 This view from NASA’s Cassini spacecraft shows a wave structure in Saturn’s rings known as the Janus 2:1 spiral density wave, reports Phys.org. Resulting from the same process that creates spiral galaxies, spiral density waves in Saturn’s rings are much more tightly wound. In this case, every second wave crest is actually the same spiral arm which has encircled the entire planet multiple times. This is the only major density wave visible in Saturn’s B ring. Most of the B ring is characterized by structures that dominate the areas where density waves might otherwise occur, but this innermost portion of the B ring is different. The radius from Saturn at which the wave originates (toward lower-right in this image) is 59,796 miles (96,233 kilometers) from the planet. At this location, ring particles orbit Saturn twice for every time the moon Janus orbits once, creating an orbital resonance. The wave propagates outward from the resonance (and away from Saturn), toward upper-left in this view. For reasons researchers do not entirely understand, damping of waves by larger ring structures is very weak at this location, so this wave is seen ringing for hundreds of bright wave crests, unlike density waves in Saturn’s A ring. The image gives the illusion that the ring plane is tilted away from the camera toward upper-left, but this is not the case. Because of the mechanics of how this kind of wave propagates, the wavelength decreases with distance from the resonance. Thus, the upper-left of the image is just as close to the camera as the lower-right, while the wavelength of the density wave is simply shorter. This wave is remarkable because Janus, the moon that generates it, is in a strange orbital configuration. Janus and Epimetheus share practically the same orbit and trade places every four years. Every time one of those orbit swaps takes place, the ring at this location responds, spawning a new crest in the wave. Daily Mail report – with more images and explanatory text. The Cassini Division is a region 4,800 km (3,000 mi) in width between Saturn’s A Ring and B Ring. Cassini observations of Enceladus clarified that conventional mainstream thinking about the nature of our solar system was based on false assumptions. In the recent past our imagination about physicists’ awareness was wrong. We failed to efficiently recognize that they are overextended far beyond the limits of their human capacity. September 13, 2017 at 3:12 pm: Linnea, I suspect particles sufficiently fine in comparision to their environment can have a ‘rheologic’ behaviour. They could be constrained by Saturn’s gravity in this case, and moved en masse by moons. Particles can be observed ‘flowing’ in a very liquid manner, possibly without viscosity, in natural and in industrial systems. Be worth asking ‘your’ scientist. Two of the features in the Saturnian ring system recently observed by the Voyager 1 spacecraft are (a) the braiding of the F-ring and (b) the radial spokes that rotate across the B-ring. Both of these phenomena are explained by recognizing that the grains that constitute both the F-ring and the spokes are charged to high electrostatic potentials and are sufficiently small to be strongly affected by the magnetic field of the planet. Processes for the charging of the grains are also suggested.